While English sparkling wine and Prosecco may be enjoying a moment of popularity, there’s no denying a classic glass of French Champagne will always be the tipple of choice for a special occasion. 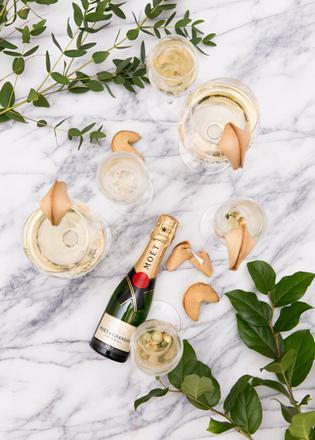 This month one of the world’s most famous Champagne producer’s, Moët & Chandon, will be offering newcomers and connoisseurs alike the chance to uncover the secrets behind this most glamorous of drinks at the Moët Academy. Hosted by wine experts Susie Barrie, Peer Richards, Jane Parkinson and Simon Stockton in Soho, London, the Academy will use virtual reality technology to offer visitors a tour of Maison Moët’s vineyards and guide them through the wine making process from grape to glass. The experts will also be on hand to answer common questions about Champagne. Ever wondered what makes it different to sparkling wine or whether you should buy Dry or Demi sec? Small, interactive tastings featuring Moët Impérial, Rosé Impérial, Moët Grand Vintage 2006 and Moët Ice Impérial will turn you into a pro in no time. The highlight of the Academy, however, is an exclusive opportunity to taste the new Moët Grand Vintage Rosé 2008 months ahead of its launch – an opportunity not to be missed by true wine lovers. The Moet Academy takes place from March 21 – April 3, 2016 at the Condé Nast College, London. Visit moetacademy.co.uk for tickets and information.